These small veggie balls are really tasty and beautiful! Don’t try to make them into a whole meal though, they are far too cumbersome to make, but rather make them as a colorful, decorative garnish to go with any other dish. 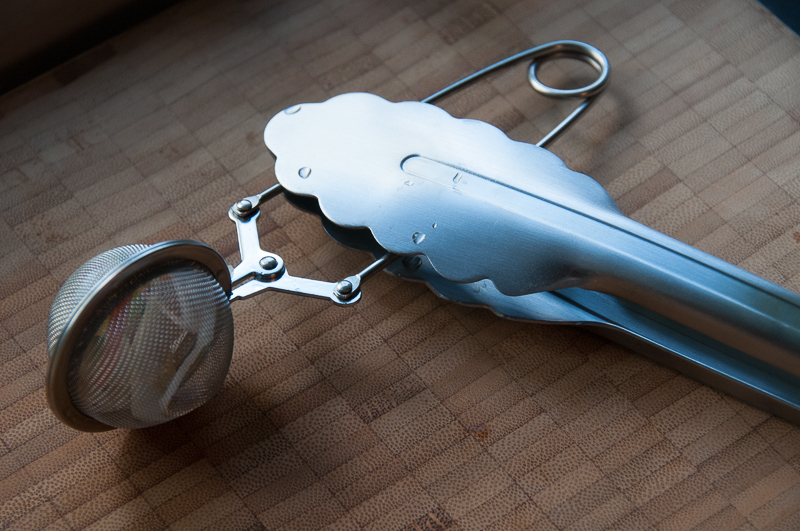 You will need 1-2 round tea strainers (see photo), thongs and oven mitts. 2. Place in colander and add the salt. Let sit for 10 minutes (in order to remove some moisture before frying). 3. Rinse the vegetables and pat them dry with kitchen towels. 4. Heat the oil in a deep pan. Make sure the oil will cover the tea strainer but use a deep pan so that the oil does not reach higher than halfway up the side. 5. 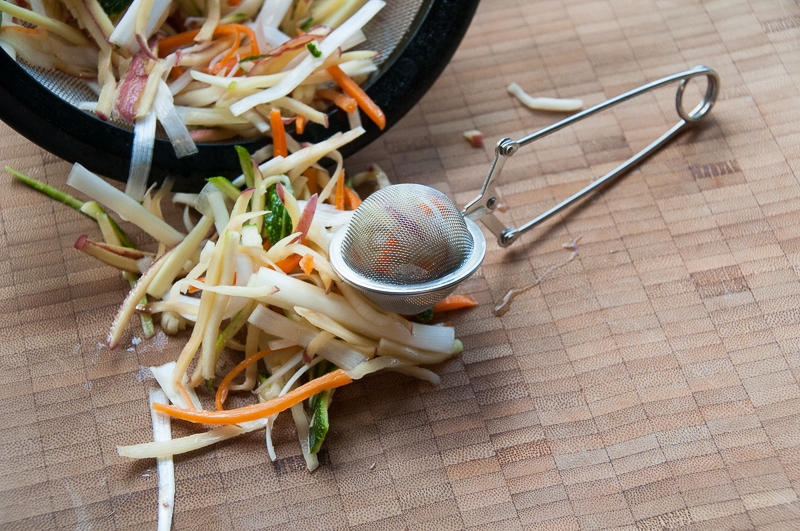 Take a small amount of veggies and place in a tea strainer, dip into the oil and let cook for a 30 seconds. Do not overstuff. 6. They should be served warm. I like to make them before hand and then, just before serving, reheat them in the oven. • Dip a small piece of vegetable in the hot oil, if it sizzles then the oil is hot enough. • Don’t worry if some pieces stick out of the tea strainer, it will just make a more interesting looking ball. • 30 seconds is usually a good amount of time but check to make sure that they are not still soft or too burnt and adjust you time accordingly. • If you have two tea strainers going, one can be dropped into the oil while you empty and re-stuff the next. • Have a small spoon handy to empty out the vegetables if they stick a bit to the net. • Use a thong and oven mitts so you don’t burn yourself. 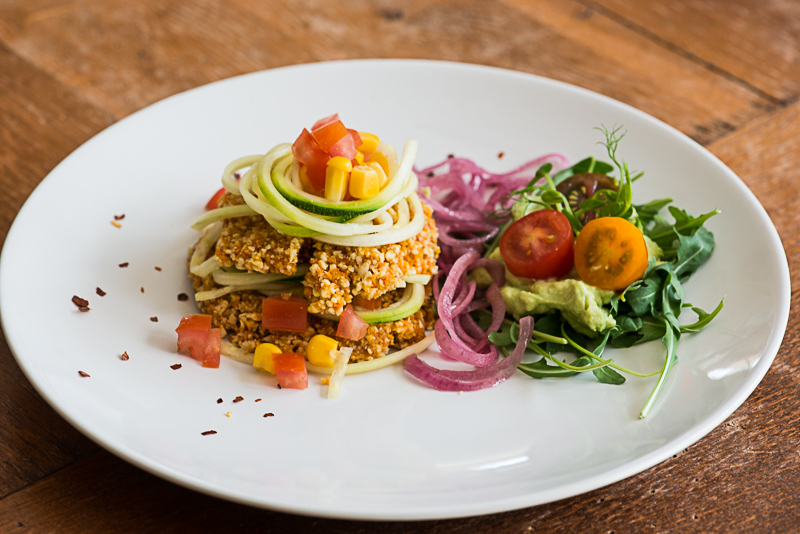 A beautiful vegan dish, served on its own or as a side dish. 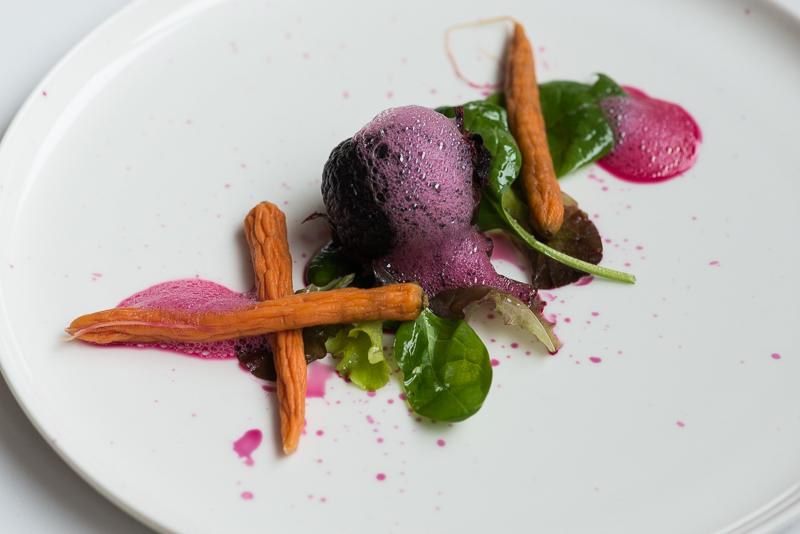 This recipe is quite similar to another sweet potato dish I have previously posted. The accompanying vegetables makes it into a new dish though. 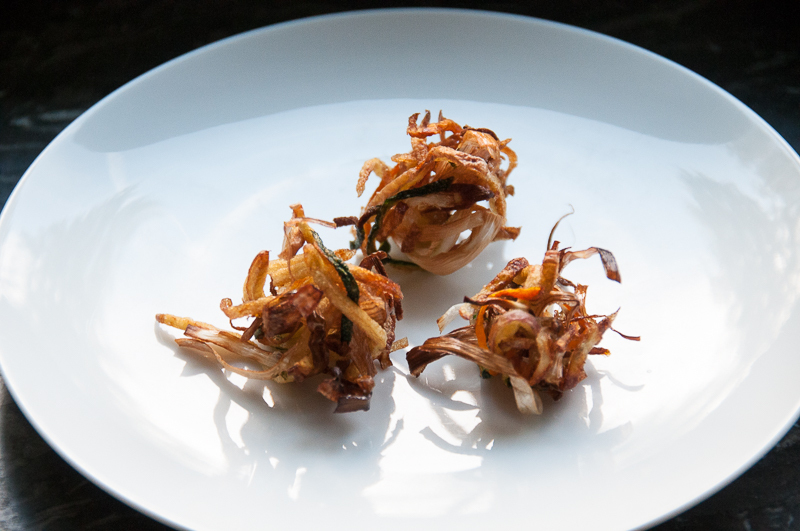 The potato crunch can be used as a base in many different recipes, even for desserts! An absolute favorite of mine. This is also one of the recipes I have developed under the guidance of Matthew Kenney Culinary School. 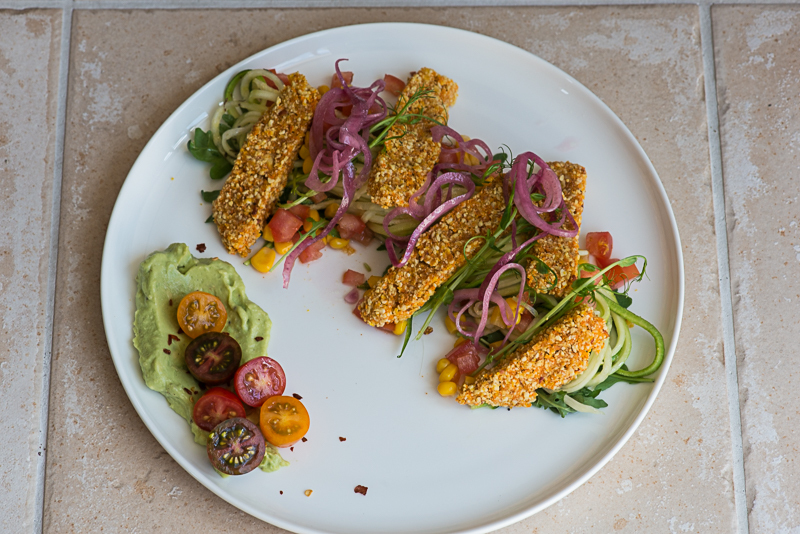 If you do not have a dehydrator, you can use a normal oven and bake the Crunch at 175C for 30-40 minutes (depending on the thickness of your Crunch). 1. Clean the vegetables to be used for the crunch mix and cut up in chunks. 2. Process the vegetables and nuts in a mixer. 3. Make 18 (3 per person) small rounds (use a mold to shape them) or rectangular sticks if you prefer (see photos). 4. Dehydrate over night (or longer, depending on the thickness of your rounds), or bake in a 175 C oven for 30-40 minutes depending on the thickness. 5. Spiralize the zucchini and marinate in the oil, vinegar, salt, agave and thyme mixture for about 30 minutes. 6. Slice the red onion thinly, using a mandolin. Marinate in the vinegar, oil, salt and agave for 30 minutes. 7. Combine the ingredients for the salsa. Set aside for the flavors to blend and mature, 30 minutes. 8. Serve the colorful dish on individual plates. Garnish. If you haven’t tried Yuzu yet you’re missing out on something! Yuzu is a wonderful citrus fruit from Japan. Can usually be found as a bottled juice in Asian food markets. Or, a possible substitute could be an equal mix of fresh orange-, lime- and lemon juice. 1. Mix the fish, juice, chili, garlic, coriander, egg, salt and lime zest in a food processor. 2. Spoon into hot, oiled frying pan and fry 5-6 minutes on each side. Take care when turning so they don’t fall apart. Serve with soy sauce. 3. Cut all veggies in small pieces. Mix the dressing and drizzle over the vegetables. 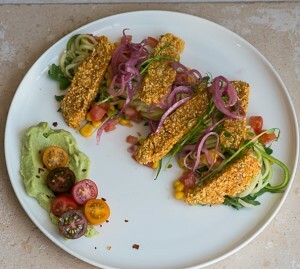 This is a fun dish that can be served together with many different foods. Go easy on the smoked paprika powder since it can be quite over powering. Any vegetable you’d like to chop up and include is fine. I’ve chosen red and white rice since they present themselves so nicely but you may also use quinoa or other grains. Can be prepared ahead of time and heated in the oven just before serving. 1. Cut the tomatoes into fine strips and then chop them into a tomato concasse. Set aside. 2. Boil the rice according the manufacturers specification. Add some salt, when almost done, add some pepper and smoked paprika powder. 3. Fry the onion in a pan, when done, add to the rice. 4. When the rice is ready, remove from the heat and add cheese and lemon juice. 6. Stir in the tomato concasse. 7. Using a mold (I use Japanese rice molds) create small rice cubes. If you save for later, then please refrigerate at this point. If not, then place the cubes on a baking sheet and bake in oven for 5-6 minutes, until piping hot. 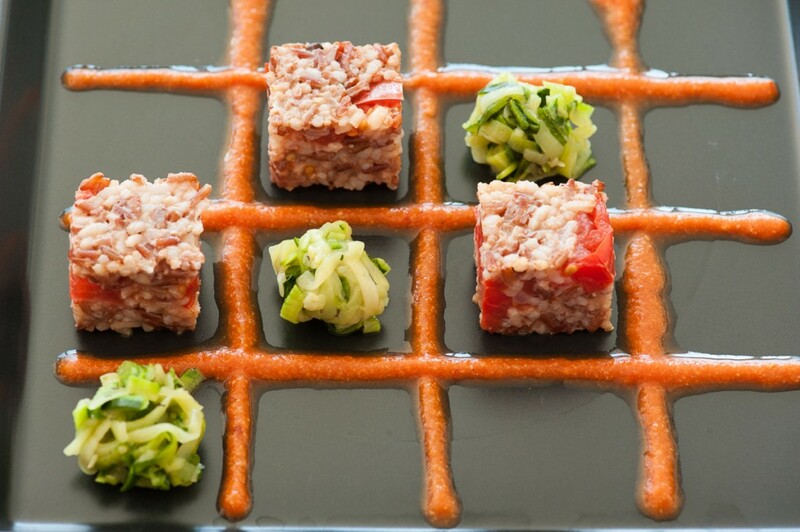 Serve the rice cubes with Courgette Spaghetti and Tomato Almond sauce (see below). Chorizo sausage also goes very well with this dish. Super quick and very rich and tasty tomato sauce. 1. Combine all ingredients except the almonds in a blender. Blend well. 2. Pour into a saucepan and simmer a few minutes. 3. Remove from heat and add the ground almonds. 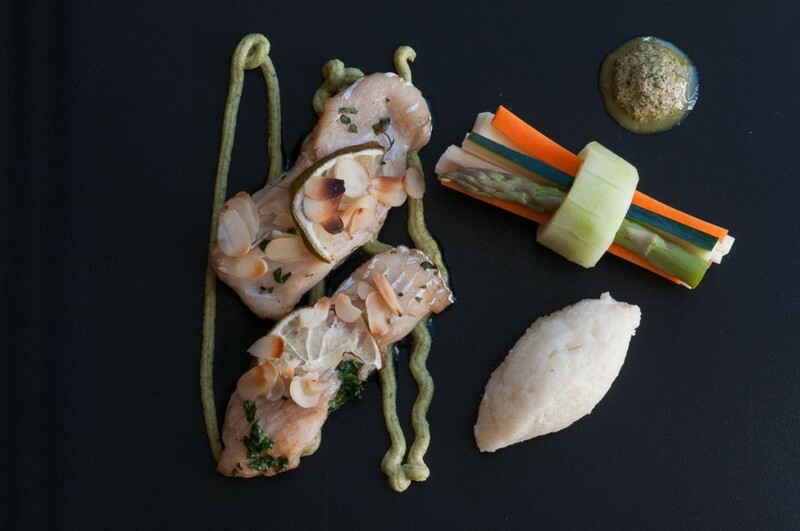 Marinated, Spiced Cod with Cauliflower Quenelle, Steamed vegetables with Basil Sauce and Broccoli Puree. 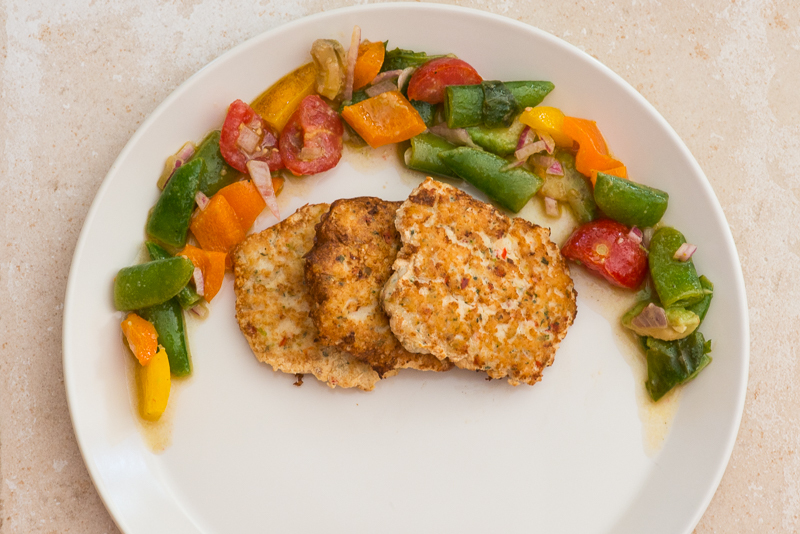 A delicious, easy and light dish that is very fun to arrange on the plate and serve. Combine all ingredients for the marinade and pour over the fish, refrigerate for a few hours. In order for the marinade to better penetrate, make a few cuts into the fish. Heat oven to 200C. Place the fish in an ovenproof dish. Season with salt and place the lime slices on top. Sprinkle with flaked almonds. Baked in oven for about 20 minutes. Place all ingredients for the basil sauce, except the oil, in a blender and process until smooth. While processing, slowly add the oil. Set aside. Boil the cauliflower in salted water until soft. Drain well (if too much water remains you will have to add more cheese to be able to form the shapes of quenelles). Using a hand held blender, puree the cauliflower in the pan. Add some Parmesan cheese, mix well and season with salt and pepper. Boil the broccoli florets in salted water. When soft, process into puree with blender. Add some cream, salt, pepper, lemon juice and nut meg and process futher. Lastly add the butter. Make sure the carrot, parsnip, asparagus and courgette are about the same length. Steam (or microwave) the vegetables until soft but still crunchy (the carrot and parsnip a bit longer than the other). Cut thick slices from the cucumber and remove some of the inside as to create a vegetable napkin holder. Place a spoonful of sauce on a plate. Prepare the vegetable napkins by placing the cooked vegetable strips inside the cucumber ring and add to the plate. Spoon the broccoli puree into a piping bottle/bag. Garnish the plate with some long piped lines and place a slice of fish on top. Using two spoons, create quenelle shapes from the cauliflower mix.